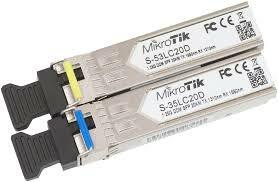 The MikroTik S-31DLC20D is a 1.25G SFP transceiver providing a 1310nm Dual LC connector. The MikroTik S-31DLC20D transmits a long distance up to 20km single mode fiber connections with DDM. Compatible products are the RB260GS,RB2011LS, RB2011LS-IN, RB2011UAS-IN, RB2011UAS-RM, RB2011UAS-2HnD, RB2011UAS-2HnD-IN, and CCR1036-12G-4S and several other non-MikroTik devices.